Fendi Casa’s contemporary booth at the Salone del Mobile. Fendi Casa has been a part of exquisite interior design projects in some of the most prestigious and exclusive locations around the world. Apartments, villas, yachts and private jets: each project curated by Fendi Casa has been described as a unique and exclusive celebration. Among such projects in the region are the Damac Esclusiva, a 150-m luxury apartment tower in Riyadh, Saudi Arabia, where more than 100 private residences have been designed and decorated by Fendi Casa, and Damac Residenze at Dubai Marina in Dubai, UAE. With careful attention to the environment, as well as to the client’s taste, Fendi Casa adds a taste of luxury with careful attention to details and materials, creating a unique environment, steeped in style and craftsmanship. The Conrad Maxi and Audrey (right) sofas. 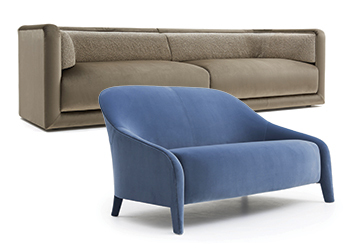 Fendi Casa recently presented its latest collection at this year’s Salone del Mobile 2016 furniture design event at Rho Milan Fairgrounds in Milan, Italy, which was held last April (12 to 17). Its two stands established a dialogue between opposing elements of style with one common denominator: the finest Italian savoir faire. Fendi Casa presented two different proposals: a project that anticipates new living concepts, strongly characterised by a refined aesthetic; and an atmosphere born of harmonious fusion between design and fashion. “The furniture and accessories express a contemporary lifestyle that is classical yet avant garde, a balance between tradition and innovation. Design, creativity and craftsmanship combine to define a collection dedicated to Italian manufacture and a focus on functionality,” says a spokesman for the Italian luxury home furniture and accessories specialist. He says soft graphic lines are elevated by a new, sophisticated colour palette and vibrant varnishes. Lamé filaments and daring chromatic combinations display a masterful use of tones enhanced by new shades of colour: caramel, tan and a wide range of blue tones, from Prussian to French blue, from midnight to sapphire. Additionally, lake green, chocolate, and sable, as well as the classical black and white vitalise the space. This theme is augmented by the bronze and gunmetal finishes for the structures, finely coordinated with surfaces in marble or in Ebony Macassar, as well as Dark Rosewood. Fabrics and yarns reveal the decorative expertise of Fendi Casa. “The silk velvets are handwoven recalling ancient techniques, while motifs related to traditional men’s tailoring are combined with precious geometric-patterned jacquards. The theme is modernised with astrakhan and crocodile patterns, adding a note of preciousness to the soft chenille, enhancing the sartorial allure of the collection,” says the spokesman. 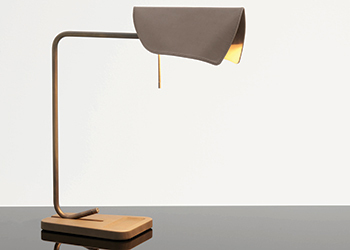 A Velum table lamp and a Fur Tablet (left). The value of the leathers is emphasised through the use of textured grains, extremely refined glossy and semi-glossy leathers such as crocodile and galuchat. Furnishings are enriched by textile accessories in fox and groundhog, with natural orylag utilised in natural and pastel shades. These crafted objects celebrate the excellence of Fendi’s art of creating furs. Among the products displayed were the Audrey Sofa, presenting an ergonomic and a comfortable seat; the Berenice Chair, designed to endow both living and lounge areas; the graceful Conrad Maxi Sofa; and the Anya bedside table, complementing the Anya coffee table. The Fendi Casa Contemporary collection blends Italian tradition with research and experimentation. The elegant and sophisticated design is defined by shapes and materials perfectly integrated with the surrounding space. 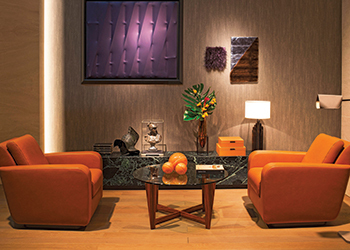 “Iconic solutions feature balanced lines, where each part becomes a signature yet functional element, such as the metal buckles of the new Soho Lite sofa designed by Toan Nguyen, or the new Velum lamps designed by Marco Costanzi, which in the wall version are also covered with fur, a renowned symbol of the brand,” the spokesman says. The new Soho Lite sofa abandons the floor base for the linear supporting elements in steel. The minimal yet refined frame is upholstered in pied de poule fabric or in chocolate leather, and embraces the macro-cushions, providing comfort and elegance. The leather buckle straps become aesthetic details and functional connectors. The Velum collection includes table, floor and wall lamps that reinterpret the powerful shape of the African tribal masks, celebrating Fendi elegance and cutting-edge design. “The excellence of Fendi is celebrated also by the Fur Tablets, which can be considered as actual works of art comprising 13 bespoke frameworks in fur,” he continues. 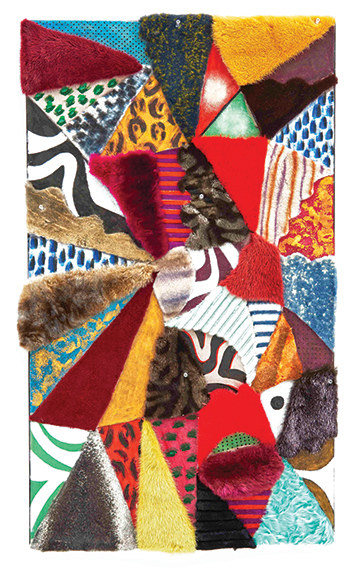 “Characterised by an absolute attention to detail, the Fur Tablets are the result of extensive research carried out by the craftsmen of the Roman fashion house to translate Karl Lagerfeld’s drawings into unique furs, representing the most daring creativity and the legendary Fendi savoir-faire in the art of fur craft. Also part of the collection is a footstool for the Blixen armchair by Nguyen. Blixen, a line of seating designed for living and office interiors, is now complete with a newly launched armchair version and its matching footstool. Proportions have been revisited to enhance great comfort without undermining the architectural character of the structure with its graphic elements in steel plate. The seat embracing the cushions consists of a distinctive mono-shell element, upholstered in leather and secured tautly by metal buckles; such details recall the world of men’s fashion accessories. Also part of the collection is a luxurious and distinguished set, the Aura ottoman, defined by a sophisticated linearity inspired by the 1920s. The elegant structure in polished brass steel supports the large top presented in the various finishes of the collection, or in leather. Fendi Casa offers a glamorous and cosmopolitan lifestyle, with a collection that ranges from contemporary to modern to classic. Each furnishing and complement is the result of extensive research and constant, meticulous craftsmanship and fine workmanship.